There are two situations when you want to hit a passing shot in doubles. First, when you want to pass only one player that is at the net, while his partner is on the baseline and second, when both player are at the net. Another option is to hit hard at the body of the net player, giving him very little time to react and catching him off guard. Usually when you aim at the net player and you play the ball low over the net, the player has so little time to judge and react to the ball that even if the ball would go 4 meters out the player will still take it and because of the ball speed will usually make a mistake. 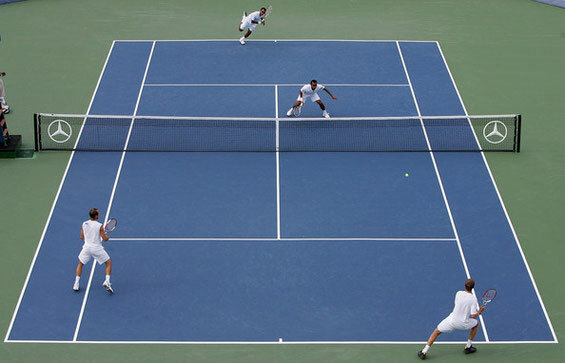 If both players are at the net, your first choice is to play through the middle of the field. Keep the ball low over the net. If the players are not very accustomed to play with each other, such ball will result in a miscommunication between them of not knowing who should take it. Another option is to play a lob. Usually down the line, so that the ball stays shorter in the air and the opponent has less time to get to it. Third option is to aim at the body of either player, but preferably play it down the line. Again by playing down the line the ball gets faster to the player leaving him with less time to react. 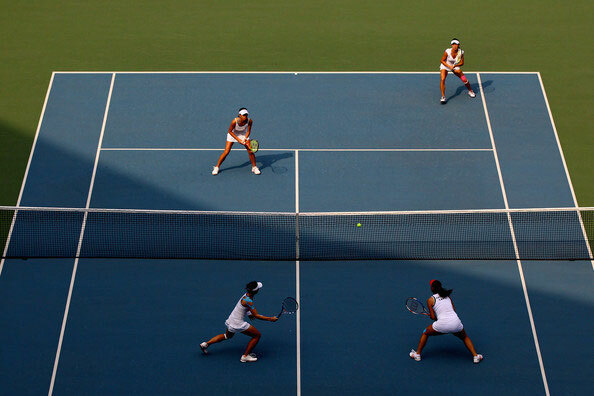 The very last option you want to employ is to pass the player with a down the line in the doubles alley shot. This is because this shot brings the largest margin of error with it (you can make a mistake by hitting the ball wide, long or in the net – with the other three options you can only hit the ball in the net or long). Well, this is it, have fun with you passing shots. Always think before you make a shot and enjoy the game!